How many of you are working in a job, career or position that doesn’t interest you? Where you just keep going to work and doing the same thing day-in and day-out because you think that is all you know and are qualified for? Or you can’t see how to get from where you are to where you truly would like to be? Or maybe you don’t even know where you would like to be or what would bring you real joy? How many of you dream of that job where you feel engaged and excited to be there every day? Where you feel the thrill of making a difference? Where what you do each day would feel fulfilling and meaningful? You may be able to do this on your own but most people would benefit from working with a great career coach who has the ability to help you look beyond what is to what can be. A good career coach will spend time helping get to the core of who you truly are as a person, what makes your heart sing and what do you do as naturally as breathing. Then it is always useful to see what issues in the world you are passionate about, what breaks your heart when you hear about it? These four things will be instrumental in moving you towards your purpose which is what will give you meaning and fulfillment. In many cases, we are able to get an idea at this point of what type of meaningful careers may fit you best based on these attributes, feelings and passions. I believe everyone is on this earth for a purpose and when you learn to tune into your heart, you will know what that is. As a result, I work closely with clients to teach them how to truly tune into their heart, their intuition and their inner wisdom, as it is always right. They will just “know” when we identify the right path as it feels good or feels right inside. Once we have that inner knowing of what feels right, what feels good and what your purpose is, we need to take stock of all of the skills, training and knowledge that you already have based on a lifetime of experiences and education. The ideal situation is when we are able to combine your current skills and expertise with what would truly make your heart sing to identify potential careers that you could earn a living at. I find that the majority of the time, the skills and knowledge you have already gained are extremely useful in moving you into what you are meant to do. As an example, my entire life and career experiences have been invaluable to me as an entrepreneur and coach. Everything I did, every decision I made…good and bad have added value to my expertise and confidence. At that point, you have to ask, what’s missing? What other skills or knowledge or certifications would I need to make this transition, if any? If we feel a skill is critical, we may pause to give you time to acquire that skill or knowledge. Or keep moving while you are attending classes or taking an online course. This step in the process helps build confidence that you are qualified and you can do it. I personally went out and took a web design class so I could build, refine and manage my own website and that made me feel more confident as a solo-entrepreneur. Once we have the list of potential work you would be thrilled with, we would need to decide if this would be obtainable by going to work for someone else or is this a business waiting to be started? Some people do much better working for others and that is fine as there are usually plenty of jobs out there that we could expertly position you for. And if you are one of those people who has the drive, ambition, foresight, vision and the desire to be an entrepreneur, we would need to analyze that route. Either path will get you to where you are ultimately meant to be if we have done a good job of getting to the core of who you are and what truly makes your heart sing. What are you waiting for? I have so many clients in their 50’s who are finally waking up to this reality and they all say to me; I wish I would have done this earlier. No worries! You can be a success at whatever age you are. Did you know Louise Hay didn’t start Hay House until she was 62? Colonel Sanders founded Kentucky Fried Chicken at 65. I transitioned into full-time coaching in my 50’s. It is never too late. And you will be happy you took the steps to begin to live the life you are meant to live! 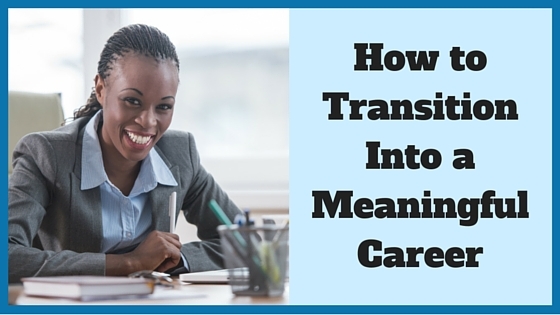 Thinking of hiring a career coach to help you transition into a meaningful career? Connect with Marla, browse our directory of career coaches and get a FREE consultation or request a personalized coach recommendation!